Pulsar Marijuana from Buddha Seeds is a feminized sativa strain and the most powerful and productive Sativa in the market. Giant plants, outstanding productions and an incredibly high power. Not suitable for beginners. Pulsar from Buddha Seeds is a feminized sativa Marijuana strain, but it is not just a simple strain: it is much more than that. Is the most potent and productive strain you will find on the market. 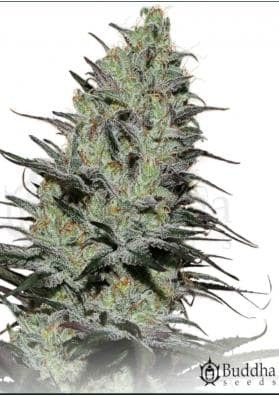 Pulsar is a non-autoflowering cross between Dutch and Central American Sativas which has culminated in a strain with an incredible ability to expand itself having an extremely vigorous growth and with a relatively short flowering period for such a Sativa strain that is so big and productive. It is not a plant suitable for novice growers and neither for inexperienced smokers since its ultra-powerful and very energetic effect is really hard to control: a hallucinogenic effect which will eventually leaving you laughing uncontrollably. And all this with a musky smell and a spice-like flavour along with a light Haze background. Pulsar becomes a giant plant with a tendency to take over all the available space so it is important to prune the tips of the plant if growing indoors, or to use the SCRoG as otherwise you will end up taking the branches throughout the window. If growing outdoors we recommend that you it towards the end of the season to avoid it growing to a monstrous size.Due to its growth characteristics, it is a plant recommended for expert growers or with enough experience. It flowers fast enough for a strain with such features: only 75 days are enough to enjoy great productions of this super powerful Marijuana.